After an unsettling visit with Devon, Richie weighs his options as Buck Rogers murder case is heating up. Thrown out of her aunt's house, Jamie crashes with Kip (Nasty Bits). 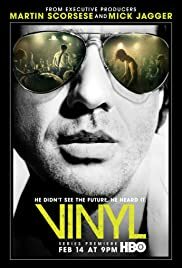 This episode is as chaotic as Richie's life and with the police putting pressure on him to rat out on the mob now involved in his label, Richie's life is in some kind of freefall even though he has made another attempt to go clean. Richie is fighting to keep the record label from going under but is pressured to release a 1950s compilation album. It does mean passing on some guy called Bruce Springsteen who might be dropped by his record label. As we head for the finale, Zak discovers that it was Richie who stole the money in Vegas and beats him up. Richie tells Devon the truth about his involvement in the death of Buck Rogers. I felt bored at times, because in some ways it just retread old ground. Lester feels let down by Richie again. The record label is in need of money. Eh, we have just invented disco.